Re: Question: How to build a Castle’s insides? Nice Keep lostpict. This is the kind of idea I am looking for. Thanx. Most of the castles I have been in have interior floors and walls of wood with exterior walls and some interior supports stone. I would love some DF CBS wood floors that had 1 edge of stone or 2 corner edges of stone. I would also love a quad post and a double post that was off-set to align with single posts. The one other thing they have are spiral stairs built into the walls - that would be cool too. I see the pictures posted of some wonderful Castle builds, but I haven’t seen any pictures of Castle insides. By Castle’s insides, I don’t mean the courtyard, tower/gatehouse insides, or walkways on top of spacers behind walls. What I’m interested in is largish buildings, maybe 20” by 20”, where 1 or 2 of the building outer walls are the Castle’s walls. Maybe a keep. Or maybe the castle doesn’t have courtyard, it is all 1 building with a largish rectangular inside. A building inside would have multiple rooms of the type you might build with KS1 Dungeons. My question is how would you integrate the Castle outside with the Castle inside? Would you build the inside, inside Castle build pieces, using mostly City builder pieces? 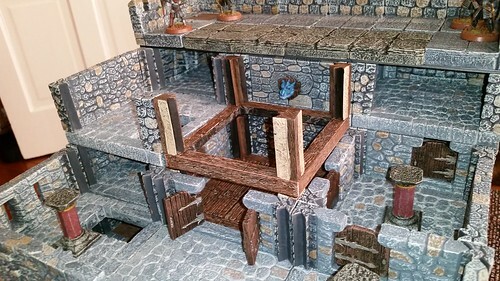 Would you build the inside separate from the outside, using KS1 Dungeons? 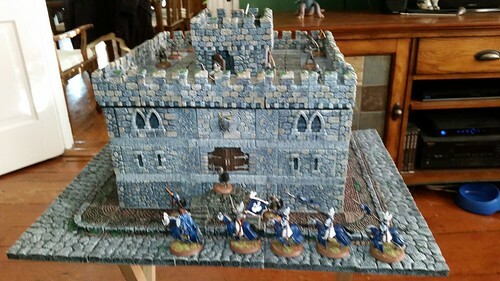 Or some other way to integrate Castle outside with Castle inside?